Logitech's Circle security camera is one of the most unique home security cameras you’ll ever come across. Going by its design and features alone, you’d even argue that it wasn’t designed to be a security camera. But...it is. This wired security camera is easy to set up and offers compatibility with Alexa, Apple HomeKit for a wide variety of applications. From the first glance, you can tell that the Logi Circle is designed to impress. Standing at just under three inches tall, this camera weighs no more than nine ounces. The Circle has a very good recorder, capable of recording 720p videos at 30 frames per second. Actually, a firmware update allows you to record at 1080p. At the bottom of the camera is a pivoting base as well as a detachable magnetic plate that secures nicely to the base. This means you can quickly set the camera on any flat surface. But, that’s not the only way to set the camera. There’s also an adhesive strip that allows you to mount the base (and camera in general) to just about any surface you want, at just about any height. The adhesive strip also allows you to mount the camera at an angle of your choice. A helpful graphic at the bottom of the base enumerates recommended mounting options. Once the base is mounted, just pick up the camera, insert it into the “socket” and position the lens at an angle that gives you the best view. The little camera comes with a rechargeable battery that lasts up to 12 hours. However, you also have the option of plugging it directly into the power outlet via a power cord. To use the power cord, you’d, unfortunately, have to position the camera close enough to the power outlet to avoid having wires crisscrossing your home. Still, it’s an excellent option if you want to keep the camera running round the clock, and having to plug it in is not a deal-breaker for most people. 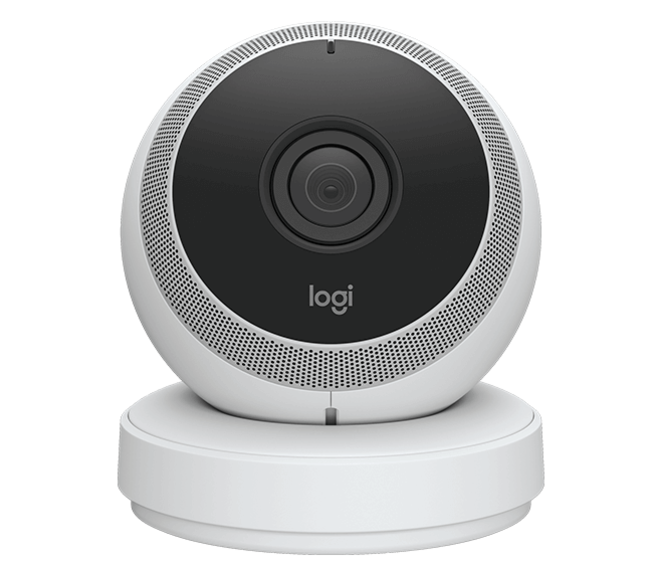 Logitech's Circle Security Camera system is very easy to set up. In most cases, you’ll be done in less than three minutes! Simply download the Logi Circle app on Android and iOS, open it, turn on your Bluetooth, and enter the required details (usually your email address and a password). That’s it! To find out what’s been going on in your home, open the Circle smartphone app and tap the “Day Brief” icon. This will show you a 30-second reel of everything captured in the previous 24 hours. You can save a clip if you wish. In the smartphone app, click on the relevant timestamp and tap the downward-facing arrow on the left side of the window. Saved clips can be sent as email attachments or MMS messages. You can also upload the clips to social media (Facebook, Pinterest, etc), or to iCloud. You can control the angle and view of the camera using the mobile app. For instance, you can rotate the camera view 180 degrees along a straight line using the app. If you do this and simultaneously manually rotate the camera 360 degrees on its base, you’ll get a 360-degree view of a room. However, even if you choose not to rotate the camera, the 135-degree view covers a pretty wide area, sufficient to capture whatever you might want to monitor. You can zoom in on your videos up to 8-times. Like most other powerful home cameras, the Circle has an inbuilt two-way talk-and-listen “intercom” feature. If you’d like to be heard speaking in the room where the camera is placed, all you need to do is press the “talking heard” icon found on at the bottom left corner of the app. The built-in microphone is pretty sensitive, capable of picking up voices several meters away from the camera, even from other rooms. You’ll be impressed with the quality of sound both on the camera and on the smartphone! Finally, the Circle also has night vision. Night vision mode is powered by an array of infrared LED lights that allow the cameras to pick up on images up to 15 feet in total darkness. This makes it a capable security camera that you can use to monitor your home throughout the night. The Logitech Circle V2 is an easy to install, weatherproof, indoor or outdoor security camera that comes standard with 180-degree wide-angle lens, full 1080p HD video and night vision. With this little device, you have the option of wired or wireless, and it also offers integration Alexa or Apple's HomeKit. 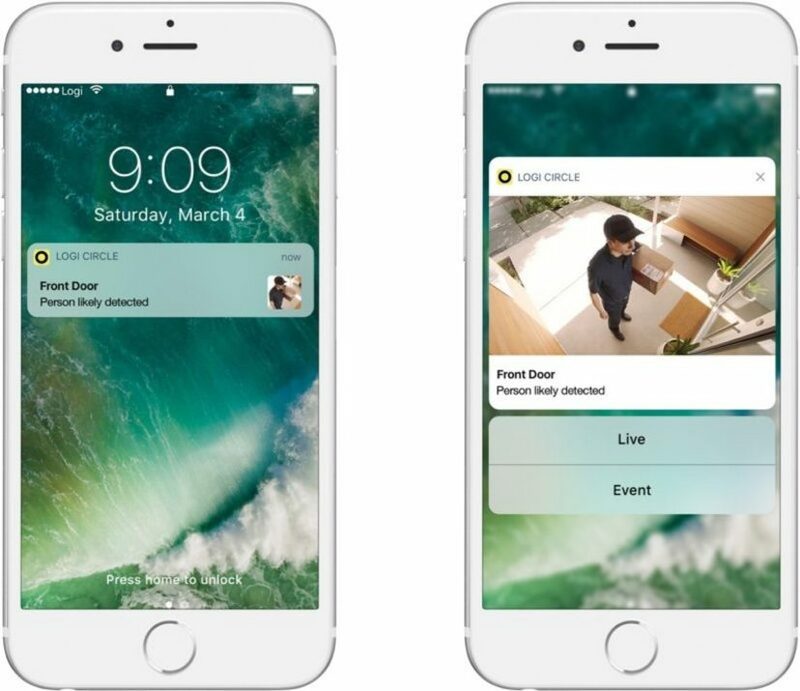 You can even ask Google Assistant to access your live stream from your smart device. The Circle 2 also comes with 14-day cloud storage by adding a Circle Safe™ subscription, while the Circle Safe Premium offers a 31-day cloud storage option. And no matter what type of setup you opt for, you'll get a 10-day FREE trial to test out your new security device and play around with its settings. 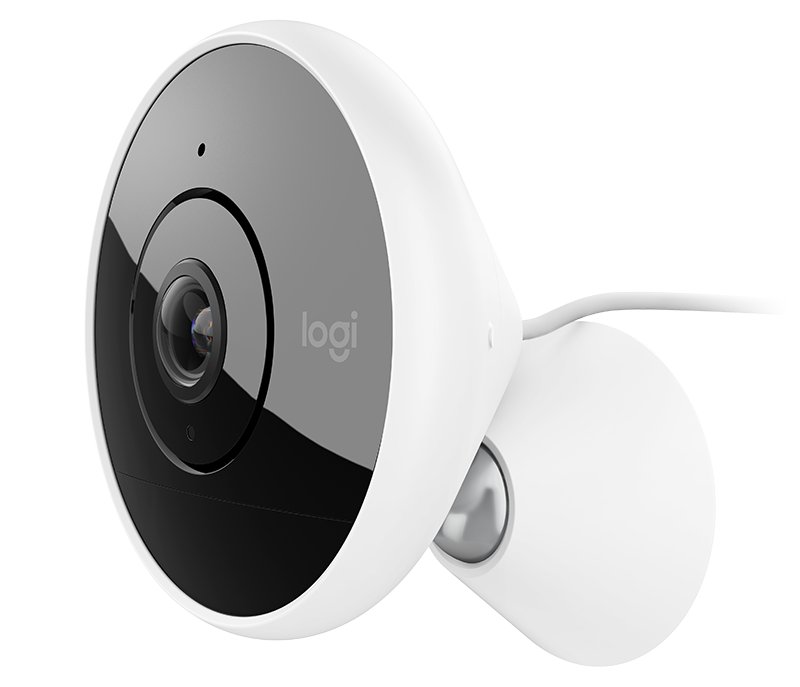 Able to capture videos from pretty much every angle, Logi Circle security cameras provide complete peace of mind from a home security perspective while giving you a real-time opportunity to record good quality videos. However, the best thing is that the camera is very simple to operate, making it an ideal option for those who believe that Wi-Fi cameras are best left to tech-savvy homeowners.